Funny how the years of the 2000s coincide with the number of years MusicfestNW has been in action—like they planned it or something. 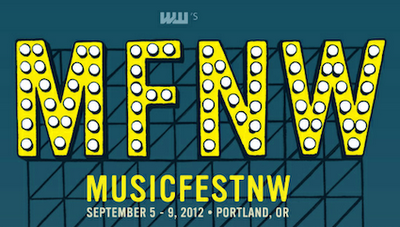 Well, in its 12th year, MFNW 2012 continues its reign as Portland's largest, completely citywide fest. And, apparently, it's also the nation's third largest indoor fest, according to Wikipedia. "The songs on Gossamer carry anywhere from 60 to 200 instrumental tracks, according to Michael. If you ask Alex Aldi, Michael’s engineer, the number 80 to 120. (The maximum output on their version of ProTools is 120 tracks.) Whatever, it’s a fuckton." The Supernature and SuperFest crew are back at it again with their most ambitious, all-ages, electro endeavor yet. 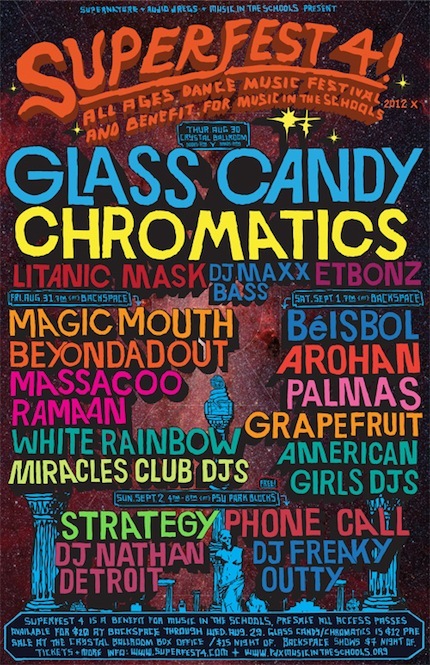 Longtime supporters of DIY dance and electronic music, SuperFest 4 will encompass four days—from Thursday, August 30th at the Crystal Ballroom with Glass Candy to two nights at Backspace to Sunday, September 2nd on the PSU Park Blocks for a free outdoor dance party—and, for the first time, benefit a local a nonprofit, Music In The Schools, run by Portland high school students. Working alongside Mast, who "booked half of SuperFest this year and does all the designs," according to Reyes, OMN spoke Manny Reyes about this organizing year's benefit as well as some tips on who to look out for on stage. This year's SuperFest has notably grown in size and scope, with four days of music and some new venues hosting the fest. But, is this the first year the fest has been a benefit? Yeah, totally. This is the first year SuperFest is a benefit—a new tradition we hope to continue. We [Eric Mast and I] were trying to come up with a cool theme and we thought how about we go for four days for the first time—and that's the theme—with a free day outside at PSU? Plus, it benefits a nonprofit organization made up of Portland teens that help music programs in Portland high schools. How and why did you choose Music In The Schools? What's your connection to MITS? I'm happy you asked this, because the honest truth is that we almost didn't do a SuperFest this year. Essentially, we chose MITS because MITS chose SuperFest as their big annual fundraiser! Eric and I met up and traded dozens of emails this summer with our friend Evan Neuhausen—who's pretty much our favorite Portland teenager ever. We met Evan at the first SuperFest, and he assisted Nilina Mason-Campbell at the last photo booth too. It was actually Nilina who suggested we meet with Evan to help promote SuperFest. And then it was Evan who suggested we join efforts on making SuperFest happen. Why the new venues this year? What will these new locations enable you to do that hasn't been possible in the past? The new venue choices were a decision made by MITS—since they are financing the whole fest and using their sponsors as well, we decided to go with venues with established relationships with MITS. Crystal Ballroom made sense because the space can accommodate any size of audience, plus they have a new sound system that will be in effect at SuperFest. Backspace is the perfect size for all-local band dance parties, plus a lot of kids and their parents are familiar with it. And we special-requested Spencer of Operative to do sound which is a huge plus. We're renting subs and decorating the place to look and sound different too. The free show (outside at PSU on SW Park and SW Montgomery) is a new idea that we are borrowing from our sister electronic summer fest Closer. It was important for us to have an all-inclusive night where anybody is free to come. 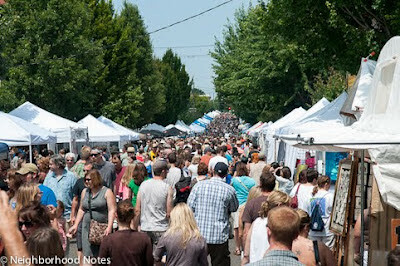 We feel the three locations make the event feel much more like a festival too—there's no doubt now if there ever was. Read the rest and find out who you should be excited about at this year's SuperFest 4 on OMN. Lents neighbor and neighborhood activist Cora Potter has issued a challenge to her East Portland community hoping to invigorate the hyperlocal business economy in her area. Do everything in your “power to only spend money east of SE/NE 60th Avenue on the weekends,” Potter says posting on Facebook. Because “small businesses aren't going to see our neighborhood as a viable market until we start spending money in our neighborhood and up the $$$$$ that changes hands here instead of taking it to Williams or Hawthorne or Alberta or East Burnside and creating the illusion that the economic strength lives there alone,” she explains. Both the Foster-Powell and Mt. Scott-Arleta districts “are on board with the east of 60th campaign,” Potter says, adding that “a few of my friends that live further north in Hazelwood and Parkrose are aware,” hoping that the word starts to spread there. 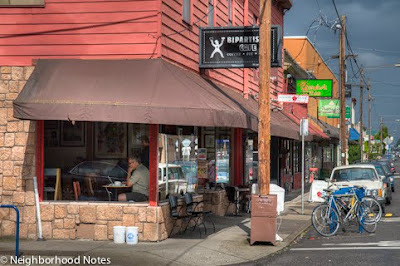 Find out why spending your money hyperlocally is important for your neighborhood and shared commercial corridor on Neighborhood Notes. The last time Poliça (pronounced po-lisa) played Portland, it was to a packed house at Bunk Bar just days after the Valentine's Day release of their debut record, Give You The Ghost. It was also one of the first gigs the Minneapolis-based act had played outside of the Midwest. Since, the electro-R&B four-piece lead by sultry-smooth singer Channy Leaneagh has played and wowed big fest stages at Sasquatch!, SXSW, and, most recently, Osheaga and Lollapalooza. And as the band continues their second run around the States, they'll hit a much larger Portland venue, the Wonder Ballroom, on Saturday, August 18th before wrapping it all up at Austin City Limits in October and then following that with dates across Western Europe in November. Born as a studio project between Leaneagh and producer Ryan Olson (of GAYNGS fame), Give You The Ghost's cool, darkly danceable electronic vibe is created by smooth basslines and plenty of electronic manipulation, from Leaneagh's beautifully Auto-Tuned vocals to Olson's intricate production, like on "Lay Your Cards Out" (below), which features Bon Iver's Mike Noyce on vocals. But, when it came to take the act out on the road, Olson decided to stay home. In his stead, Leaneagh enlisted bassist Chris Bierden and two drummers, Drew Christopherson and Ben Ivascu, all of whom also played on the record, to aptly recreate the album's elements live. And as they've made the aforementioned rounds, the live sound has evolved into an even tighter and cleaner package that really allows Leaneagh's true vocals to shine—not to mention it's just a joy to watch the pair of drummers deftly knocking out the layered beats. And without Olson, this lineup is continuing to turn heads, like independent New York record label Mom + Pop Music. The band are set to re-release the full-length album Give You The Ghost on August 14th alongside a Dark Star Remix EP, which features Gardens & Villa and Exitmusic. Plus, they'll surely turn more when they appear on Jimmy Kimmel Live, their second late night TV performance, on August 22nd. 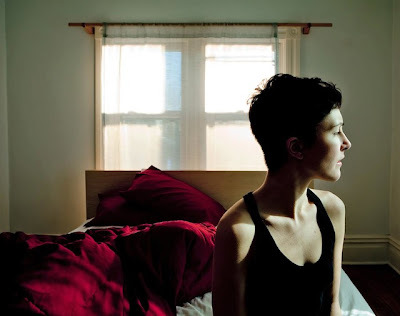 Talking about touring highlights and not rushing the new music, OMN spoke to Poliça's Drew Christopherson via email in the week leading up to the show. Tell me the significance behind the name Poliça. We were intrigued by the idea of having a name with little to no previous associations to it. Sort of like naming a human or a pet. Poliça is actually a slight misspelling of a foreign word [Polish] meaning "policy," which seemed like an apt declaration of our purpose as a band. While we enjoy coming together as friends and creating music for the simple thrill of it, we also felt a sense of urgency and duty to make this band the best it could be, and that would be our policy. Also, it looks good in print. This is the third installment in Neighborhood Notes’ series on indie business collaboration through space sharing. There’s something exceptional happening in the old Pacific Hardware and Steel building on NW Nicolai Street. More than a century after its construction, Portland-based producers of distinctive, period-specific lighting fixtures and furnishings, Schoolhouse Electric, took up residence in the massive, four-story red brick warehouse, inviting a few friends to help them fill the 103,172-square-foot building. 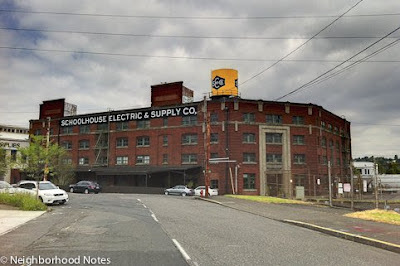 The old edifice adjacent to the railroad tracks has housed many businesses over the years, but following a comprehensive 2009 renovation, Schoolhouse Electric purchased the property, dubbed it the Schoolhouse Factory, and has since ushered in the most dynamic period in the history of the nationally recognized historic locale. To do so, Faherty invited other local, independently owned businesses to share the space, leveraging their audience, products and services to create a collaborative work environment that provides an exceptional experience for customers and collaborators alike. As Faherty envisioned his future company headquarters, he knew he wanted a coffee shop on-site, not only to create an ambiance and service his own employees, but also to draw customers to the slightly out-of-the-way destination. Din Johnson, the owner and head roaster at Ristretto Roasters, was attracted to not only the space but also what he calls "the last industrial frontier" and a neighborhood full of artists. But being an industrial frontier, Faherty understood that the location was not a high foot traffic area, like Ristretto’s other locations. With his collaborative vision in mind, and against the advice of one of his financial advisers, Faherty proposed to Johnson that rent would be free. "We were looking to leverage his audience as well by putting us in the same building,” Faherty explains. “What we were going to get out of the deal in return for not charging rent was, potentially, customers and just people who were going to come into the space." Faherty recognized that, aside from setting up shop in a somewhat idle area, Johnson also invested six figures in the build out of the corner coffee shop. As it stands now, the nascent partnership is still an experiment and the situation may change depending on the results. Faherty alludes to the fact that Schoolhouse will probably charge for utilities in the future, "but in the beginning, we're not charging any rent and we're not charging any utilities because we want to give them a chance to get in and get the word out to their audience, and our audience, that they're here," he justifies. Read more about the other collaborations, like independent designers Anna Mara and Reed LaPlant as well as Egg Press, happening in the Schoolhouse Factory on Neighborhood Notes.